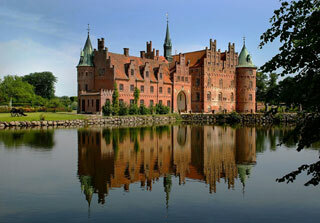 Egeskov Castle (Danish: Egeskov Slot) is located in the south of the island of Funen, Denmark. The castle is Europe's best preserved Renaissance water castle. This article uses material from the Wikipedia article "Egeskov Castle", which is released under the Creative Commons Attribution-Share-Alike 3.0 License.